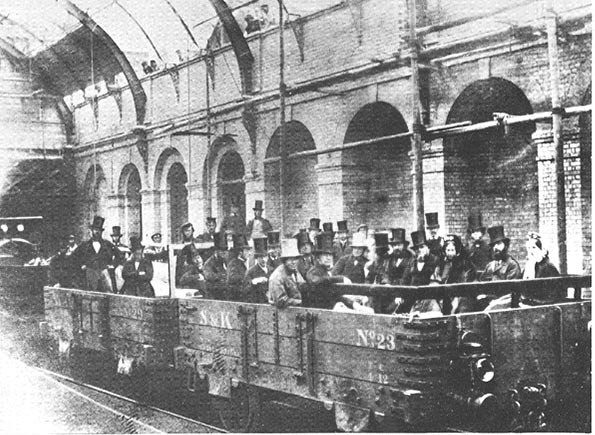 The Metropolitan Railway, London, before its official opening. 1862. According to Betjeman, "William Ewart Gladstone, then Chancellor of the Exchequer, is on the right of the man wearing a white hat. Betjeman, John. Victorian and Edwardian London from Old Photographs. London: B. T. Batsford, 1969. Plate 147. Wolmar, Christian. The Subterranean Railway: How the London Underground was built and how it changed the city forever. Rev. ed. London: Atlantic Books, 2005.